You have followed the process described in this series of pages, assembling an M1 Garand from a receiver and a collection of parts. You have completed the final assembly. Now your rifle is ready to fire! Or is it? There's a lot of debate over how to break in a barrel. I think that some of it is real science, some is going to be superstition, and you'll probably never know which is which. The problem, as discussed in more detail by a barrel manufacturer, is that the finish reaming process will leave reamer machining marks in the throat (that is, the boundary area between the chamber and barrel) and these marks are perpendicular to the bullet's direction of travel. Those marks are tiny grooves that scrape copper off the bullet jacket. That copper dust is vaporized in the plasma of the burning powder and carried down the barrel. As the plasma transitions to gas and then further expands and cools, some of the copper is deposited on the barrel bore surface. If another round is fired, the copper on the bore surface will pull more copper off the jacket of that next bullet. The result would be copper build-up in the barrel. The idea behind a barrel "break-in" process is to shoot one round at a time and clean after each shot with a solvent that removes copper fouling. Each shot further smooths the machining marks, and the cleaning removes that one shot's copper tracks. Enough shots will smooth the throat surface enough to largely obliterate those machining marks. The alternative is to finish lap the throat with a very fine abrasive. Krieger Barrels says "One national champion we know polishes the throats in his rifles every several hundred rounds or so with diamond paste to extend their accuracy life." So, how many shots are needed to polish the throat? It depends.... The metallurgy (both chemistry and heat treating) will affect the hardness and abrasion resistance. Higher abrasion resistance (as with chrome moly steel versus stainless) means it will take more shots to smooth out the marks. Chrome moly also has higher chemical affinity for copper and so it will have more copper deposition for a given level in the hot gas. Without some uncommon optical gear you aren't going to see those marks at all, let alone in detail. The closest you could come to an experiment to find the magic number would require building multiple rifles with barrels that are identical in metallurgy, initial machining and finish reaming. Then use different break-in sequences on them and compare their accuracies when shot from a vise-like mount. There will always be plenty of argument over how much is appropriate with no hope of really answering the question. It's going to be one anecdote against another with nothing but very subjective comparisons. 25 cycles of one shot and clean. 5 cycles of 3 shots and clean. 3 cycles of 5 shots and clean. 5 to 25 cycles of one shot and clean. 2 cycles of 3 shots and clean. 1 cycles of 5 shots and clean. 5 cycles of 1 shot and clean. 1 cycle of 3 shots and clean. 1 cycle of 5 shots and clean. Aunt Gracie Shoaf also had a burglar phobia, but she met it with more fortitude. She was confident that burglars had been getting into her house every night for four years. The fact that she never missed anything was to her no proof to the contrary. She always claimed that she scared them off before they could take anything, by throwing shoes down the hallway. When she went to bed she piled, where she could get at them handily, all the shoes there were about her house. Five minutes after she had turned off the light, she would sit up in bed and say "Hark!" Her husband, who had learned to ignore the whole situation as long ago as 1903, would either be sound asleep or pretend to be sound asleep. In either case he would not respond to her tugging and pulling, so that presently she would arise, tiptoe to the door, open it slightly and heave a shoe down the hall in one direction, and its mate down the hall in the other direction. Some nights she threw them all, some nights only a couple of pair. 60-копек stamp commemorating Soviet snipers in the Great Patriotic War. U.S. Marine Corps sniper in a ghillie suit. U.S. manual FM 3-0.5.222, "Special Forces Sniper Training and Employment", Chapter 2, paragraph 2-103, specifies an initial cleaning and drying, followed by ten rounds of a single shot and thorough cleaning. Then five groups of three rounds each followed by cleaning. 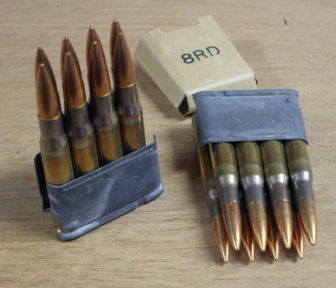 Cleaning is to be done with Shooter's Choice Solvent followed by Sweets 7.62 copper remover. That manual mentions that their barrels have already fired 60 test-fire rounds at the factory. The short answer is that the windage and elevation knobs should move the point of impact one inch at one hundred yards for each click, assuming standard issue M2 Ball .30-06 ammunition. The elevation knob should move the point of impact of standard issue M2 Ball .30-06 ammunition by 1 inch at 100 yards. The precise movement depends on the bullet velocity and aerodynamics. The windage knob should move the point of impact of any ammunition by 0.96 inch at 100 yards, a little less than one minute of arc. If the direction of fire is 12:00 o'clock and horizontally to your right is 3:00 o'clock, then a properly lubricated M1 will almost always eject the brass within the arc of 1:00 to 2:30 o'clock. The brass will be thrown further to the rear as the rifle becomes dirtier and less well lubricated. I have another page dedicated to M1 Garand troubleshooting. Not that I expect you to have any trouble, but if you need it, it's here. Target width 48" 72" 72"
7-ring diameter 25" 36" 60"
8-ring diameter 19" 24" 44"
9-ring diameter 13" 18" 30"
10-ring diameter 7" 12" 20"
X-ring diameter 3" 6" 10"